In just the past 3 years, eda has provided civil engineering, surveying and land planning services to 12 different Greek houses at the University of Florida. This work has been in conjunction with Hug & Associates, Walker Architects and several local contractor partners. These projects provide state of the art housing for hundreds of UF students and has injected millions of dollars in construction activity locally. Read the Gainesville Sun article here. The new face of Sorority Row will be almost unrecognizable. When the University of Florida’s Delta Delta Delta mansion was rebuilt in 2007, a lull in construction followed. But in recent years, a building boom has hit Sorority Row, sending a ripple effect of rebuilds and renovations for at least 10 sororities, said Beth Page Pelzer, who is overseeing the reconstruction of the Delta Gamma House. Delta Gamma, Zeta Tau Alpha, Alpha Epsilon Phi, and Phi Mu. Alpha Delta Pi will be torn down in May, Alpha Phi has plans to build a house on Fraternity Row next to Pi Beta Phi and Sigma Nu. Sigma Kappa was rebuilt in 2016, Gamma Phi Beta added its house to Sorority Row in 2018, and Alpha Chi Omega and Kappa Kappa Gamma have built additions. Fraternities at UF have also been in a rebuilding mode, Pelzer said. They include: Kappa Sigma, Alpha Epsilon Pi, Theta Chi, Sigma Nu, Alpha Tau Omega and Beta Theta Pi. Pelzer joined UF’s Delta Gamma in 1969 and lived in Delta Gamma’s original house, built in 1952, for five years. While Pelzer’s love for the sorority has not diminished over the years, her attachment to the 65-year-old house has. Pelzer, now the vice president of Delta Gamma’s house corporation board and the sorority’s recruitment adviser, initiated the idea of rebuilding the house three years ago. The work began last May and is expected to be complete by May 2019. When Pelzer attended UF, she recalls students bringing only a pencil, paper and sometimes a typewriter to school. Pelzer said the house is outdated in its ability to support all the electronics that students now need. In addition to the limited supply of electrical outlets, there were constant issues related to air conditioning and plumbing. Back in 1952, there was no air conditioning. Maintenance teams stopped by Delta Gamma weekly in recent years, she said. “We just prayed the whole year that we could keep the house going so we didn’t have to go out and spend $50,000 on a new air conditioner that we wouldn’t use next year,” Pelzer said. Since the original house was built with cinder block, electrical, air conditioning and plumbing renovations would require gutting the entire house, Pelzer said. As anyone who’s ever watched a television home improvement show can attest, once you start digging around during a renovation, other issues can appear. Pelzer said it became clear it would be best to “bite the bullet” by rebuilding. While renovating plumbing and electrical units individually would cost $75,000 less than the $10 million project to rebuild, it still would have been a logistical inconvenience, Pelzer said. Alumnae raised $1.5 million for the rebuild. The rest of the funding for the new house was financed with a mortgage, Pelzer said. Providing more space for members was another objective. While Delta Gamma was already at a substantial 19,000 square feet, space was limited for women to live in the house, have chapter meetings or enough dinner seating, due to an increasing number of members. The new three-story house will stand at an impressive 25,000 square feet, sleeping around 71 women, about 15 more than the old house, Pelzer said. Pelzer said the house will provide an elegant and functional place to live. Some features of the new house include a large sun deck, a flex room for testing and dance practices, the ability to charge devices almost everywhere, a dedicated study room on each floor and T.V. rooms. “It’s going to be very different from what everyone else on campus has,” she said. When Pelzer began as recruitment adviser in 2008, only 1,200 women were going through recruitment. Pelzer said 1,700 women at UF now go through recruitment, and new-member classes have increased from about 50 women to 90 women. Chapter totals also have increased from around 160 to numbers in the 200s, Pelzer said. Logan Gertner, a project manager at Scorpio Construction, is managing the rebuilds of Delta Gamma and Gamma Phi Beta. 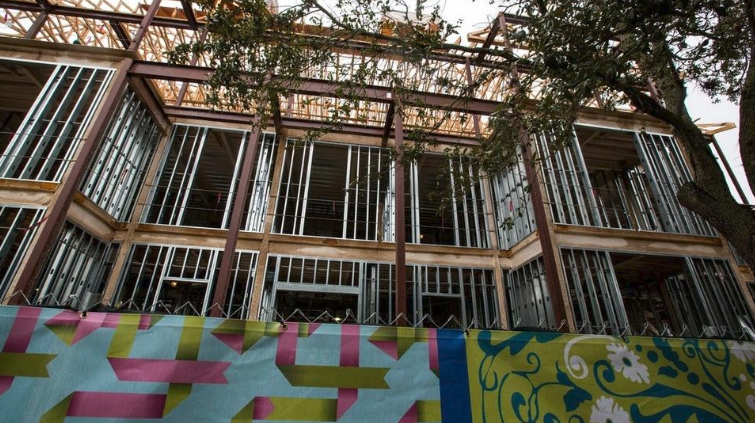 Scorpio Construction is eager to hand the keys over to the Gamma Phi Beta, knowing it has delivered the sorority’s first UF house, Gertner said. Gertner has been in the industry overseeing major projects for eight years. Scorpio Construction also rebuilt Sigma Kappa in 2016, Gertner said. Gertner said the sororities and fraternities are tremendous resources for UF and the community at large because they aid local and national nonprofit organizations. The great thing about the architecture for all the new houses is that it maintains a consistent and complementary aesthetic, Gertner said. 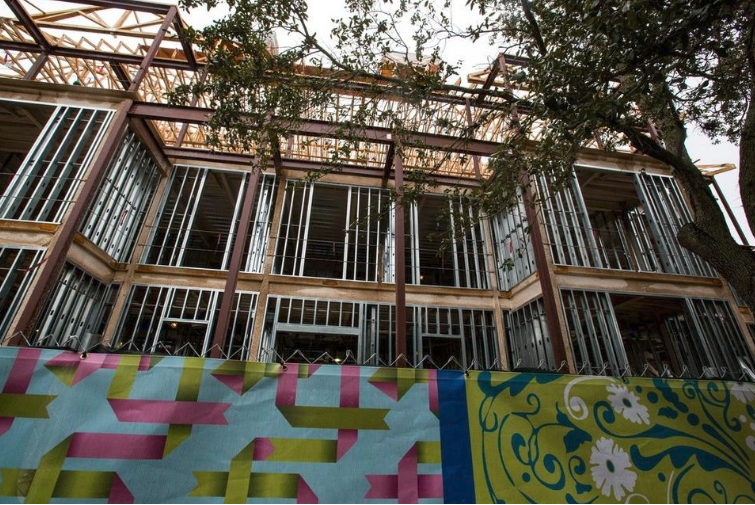 It respects the history of the sororities, along with UF, while the interiors reflect the range of personalities each of the sororities have, Gertner said. Gertner said the houses’ remodeling is purely a sign of the aging structure and changing demands on the facilities. Becky Cato, a Louisiana State University Phi Mu alumna and a member of the house corporation board for UF’s chapter, said Phi Mu’s configuration allowed the sorority to expand and renovate rather than to completely rebuild. Phi Mu is building a three-story 10,000-square-foot addition. The addition includes more bedrooms, making Phi Mu more competitive with other chapters. The cost of living in a sorority house is much less expensive in comparison with off-campus apartments and houses for students, Cato said. Cato said the renovation will be completed by early December, which will allow more members the option to live in house starting in the spring semester. In May, the front stairs of Phi Mu will be reconstructed and finished by September. Membership in individual chapters at UF is nearing 300, similar to other chapters in the south at LSU and the University of Alabama, Cato said.